The pages of history are closing on those who waged war on Iraq---Bush, Blair and Howard--and then stood shoulder to shoulder with Republican America against Europe on Iraq. 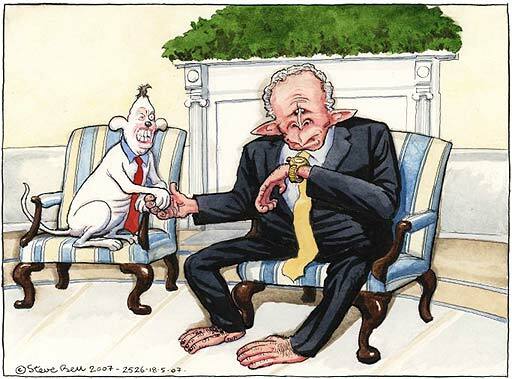 Blair has gone, wounded and despised, whilst Howard is looking at the writing on the wall. Bush is now a lame duck president and a political paralysis now grips the Bush administration in Washington. Their rhetoric within the Republican FOX News framing--- about bringing democracy to Iraq and turning it into a model for the rest of the Arab world---trades on illusions given the on-the-ground realities: chronic instability, an incipient civil war, endemic violence and anarchy, an upsurge of terrorist activity of every kind, and a national insurgency to which the Anglo-American allies have no answer. Iraq in becoming a failed state, is the new heart of darkness. Even Riverbend, who wrote Baghdad Burning, is leaving Iraq, thereby joining 2 million of her compatriots. I appreciate that Blair talks about God being his judge over the Iraq war, and that Bush, as an imperial president, reckons God is by his side in his imperialist war to ensure US hegemony in the Middle East. What then are to make of the abject failure of Congress to perform its constitutional duty of oversight? Do we presume that the devil is on the side of those Americans who want to rebuild the constitutional system and subject the government once again to the discipline of checks and balances? Does God talk in terms of Republican FOX Newspeak and talking points? No doubt history will pass a harsh judgment on Blair and Bush's intervention in Iraq. The United States military has made little secret of its view that the bloodshed in Iraq can now only be contained, rather than stamped out and that's the best call. Rumsfeld, Bolton, Wolfowitz are gone ; Kagan 's surge plan is failing, Gonzales, as Attorney General is facing no confidence moves, Karl Rove is under seige, President Bush 's polls are at their lowest levels ever, and the British have had enough. Only the Australian conservatives are left waving the flag for Commander Codpiece. We should not forget that the US currently maintains 737 military bases (by official Pentagon count) in more than 130 foreign countries on every continent except Antarctica. Blair supported Bush's belligerent unilateralism toward other countries and he went along with the imperial presidency's contempt for international law. So did Howard. For both regional US hegemony in the US should not be challenged. It is deemed to be right. Both Blair and Howard sycophantic relationship with the hard neo-con power in Washington meant that they accepted the apocalyptic discourse of the “war of civilizations”, where in black and white terms they see the forces of Good (the West) confronting the forces of Evil (Islamic “terrorism”). Unlike the Europeans, Blair and Howard have tacitly accepted the current US strategy to turn Afghanistan into a client state under a NATO flag from where US power projection into the Persian Gulf and the Middle East and South Asia and Central Asia would become possible. However, it does not look as if it is possible for US to accomplish its objective of creating a vibrant Afghanistan to consolidate its presence in Central Asia as a part of a traditional realpolitik strategy. Will the US pursuit of a tactical annihilation of the Taliban came at the strategic cost of radically destabilizing Pakistan? Currently, the US's strategic position in Afghanistan and Pakistan is a defensive one---retaining a long-term strategic foothold as the Taliban, captures the odd town and approaches Kabul's city gates. On the issue of Congressional oversight; seperation of powers is only as good as the party machines. This can probably be included as violence of faction, and hence detrimental to any republic. I think a (constitutional) sortitionist group is the only way to counter this other than banning parties; which causes more problems than it solves. opposition parties dont have access to classified information. I'm not sure that the Democrats, when they return to power in the Presidency, will cut back on the powers grabbed by Bush.I suspect that they will retain them. The Democrats in the US are not an opposition party. They control both houses of Congress. So they are in a position to make the Republican White House accountable. And they should, because Congressional oversight is one of the responsibilities of Congress in a system of checks and balances. My comment above was placed on the wrong blog. It reflected on the fact that opposition parties do not have access to all information and people should bear this in mind when they are making statements about terrorism and such. well the information has never been very forthcoming. If the Opposition parties had control of the Senate they could have investigated the extent to which the "war on terrorism" is being fought on of lies and deception as opposed to factual evidence. I had an interesting conversation this week with a chap who has been working in Iraq in Private Security for 4 years. His opinion and that of the people working in his field is that when the U.S pulls out the civil war will spread through the whole area and there will be nothing left. Also most believe this Government to be more corrupt than Saddam's. It must be nice for Bush and Blair to contemplate their retirements. Deck chairs and drinks with umbrellas. I think that we need to distinquish between the state military and the private security forces in Iraq. The war has been privatised. All talk about troop withdrawals refers to the official army not the privatised one. Secondly, the private security chap's account ignores how much of (not all, as there are many layers of violence and conflict ) the violence is an insurgent nationalist one that wants the US out of Iraq, and uses violence to try and drive them out. That kind of violence would lessen if the US army left. Yes there are many issues was his general opinion and there will be no solution while the U.S remains is the general consensus of opinion on the ground. It is interesting to note that most of the media reports about Iraq that I'm currently seeing in Australia (on commercial television) are coming from embedded journalists in the Australian army. The line is that these troops are doing a wonderful job in terms of reconstruction in Iraq. Of course, the wider context of Iraq is ignored in these pieces organized by the Australian army. as trying to help whereas the others are trying to Control. Yes your statement about the way the story is being portrayed is correct but its the same the other way too. I'm not saying that the Australian troops are not doing a good job re reconstruction in southern Iraq. It is good that they are helping to rebuild the country--- the basic reason why the troops are there, now that the dictator who had WMD that threatened Australia's national security is gone? And I'm sure the Australian troops are well liked by Iraqi civilians. What I'm objecting to is the glib media that makes no effort to understand the complexities behind this kind of account. Who is the enemy that fires on Australian troops? The terrorists is the assumption. Who are they? Who is targeting Australian troops in southern Iraq when they are doing such an excellent job? Silence. It's the big unknown for the 'fly in fly out' journo filmed in their flackjackets.They make no attempt to analyze what is happening in southern Iraq. The suggestion or implication is that it is the international Jihadists such as Al Qaeda. All the bad guys are Al Qaeda for this kind of embedded journalism. It supports the line of the official spokesmen, who tell us about an international war being waged on global terrorism; the need to spread democracy and Western values among the benighted Middle Easterners; and that Iraq is a critical battleground in the fight against global terrorism--ie., the main front against al-Qa'ida. The reality is otherwise. It is more likely to be the Mahdi "army" of Muqtada al-Sadr firing on Australian troops. The latter is now opposed to any extremists who target Sunni Arabs in general as opposed to "al-Qaeda." He is reaching out for a political alliance with Sunni Arabs of a nationalist sort. Hence the insurgency --- it is not right for Iraq to be occupied by foreign military forces. The 'us and them ' 'good and evil' discourse of conservatives in the media makes little sense in Iraq, as there is not 'one' civil war, nor 'one' insurgency, but several civil wars and insurgencies between different communities in Iraq. In all probability Iraq is on the verge of being a failed state, which faces the distinct possibility of collapse and fragmentation. Al-Qa'ida's agenda is to reach out beyond Middle Eastern borders and perpetrate terrorist atrocities in capitals around the world. There can be no doubt that al-Qa'ida is closely monitoring political debates in Australia, Britain and the US and would celebrate the withdrawal of troops by those powers as a clear-cut victory. There can also be no doubt that al-Qa'ida would not hesitate to use indiscriminate terror to influence election outcomes in Western democracies as it did in Spain with the Madrid train bombings. It's paranoia of the conservative unconscious that is disclosed here. Well the fact that you have a grasp at what is going on is proof that the truth is filtering through the biased media coverage. Mainstream media will always give differing opinions of a war event depending of which sides you are watching. Australia involvement in Iraq is minuscule really. Pure Tokenism. And if it wasn't for the fact that we have all those Indonesian Muslims living on our doorstep we would not even be there now. My accounts are based on doing a bit of research and reading reports prepared by ngo's. In marked contrast to the excellent investigative work by Paul McGeough --eg.,Taliban rising--- the Canberra Press Gallery's research is to recycle media releases and media briefings. They do not even question these official accounts. So their work lacks substance, and they end up serving a right-wing narrative, without realizing what they are doing. From what I can see it is only Media Watch on ABC television that is drawing attention to this. The failure of the national press to do its job is a key issue. I appreciate that this dysfunctional political journalism is the result of people whose modest goal is wanting to do their jobs to the satisfaction of their employers. I accept that the puff pieces are what the mainstream media environment now demands. So bias and corruption is intrinsic to the establishment media culture and how it routinely operates. That's the issue. a dangerous spill-over from the United States and NATO-led struggle to pacify neighbouring Afghanistan. But within Pakistan, a brutal, fundamentalist uprising also frays the fabric of a society that, politically at least, has been broadly secular for decades. Pakistan under Musharraf is not an effective ally of Bush ---the Pakistani military is in retreat.